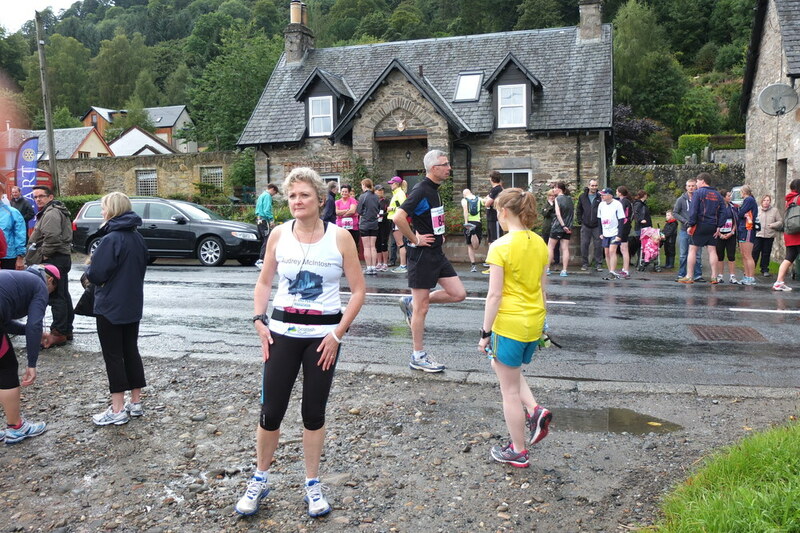 Saturday 7th September, Perthshire Highland Marathon. Secondly, the event: this was the 2nd running of the Perthshire Highland Marathon organised by The Rotary Club of Aberfeldy & District. In addition to the marathon there is a half marathon, and this year, a cycle marathon. I had participated in the marathon last year, but was a DNF, dropping out after 13 miles. I saw a big change in the organisation of the event this year. It was a good event last year, but this year was better. It had grown up. The organisation was efficient and slick from registration through to being able to get your official chip time and finishing certificate within minutes of finishing. There were plenty of smiling and encouraging marshals along the route and plentiful supplies of water, jelly babies and oranges. It is a value for money event with a lot of nice touches and extras included in the entry fee: camping, pasta party, massage, ceilidh and barbecue, and lots of tea, fruit and cake at the finish. Overall it is a great event that will hopefully continue to run for many years to come. The route is a scenic loop taking in the best of the Perthshire countryside from Aberfeldy round to Kenmore located where Loch Tay drains into the source of the river Tay, and home of the fascinating Crannog centre; through the Taymouth Castle grounds, once visited and praised by Queen Victoria but suffering a chequered history in recent times; and then back down the road into Aberfeldy. The route undulates gently to Kemore; then there is a half mile climb out of the castle grounds before a gift of about 4 miles downhill back into Aberfeldy. Finally, my race; I had demons to deal with after last year’s DNF. I was bitterly disappointed when issues with low energy levels forced me to drop out, my second DNF of 2012. As it turned out the energy issues (headaches and insomnia) were due to low magnesium, which once identified was something that was quickly and easily rectified by a tweak in my diet and some supplements. But it took a bit of figuring out. This year could not have been more different. I came to the event confident in my ability to complete it. The only question was how long it would take, as I had only had 2 weeks recovery after an Antarctic Odyssey rehearsal week which saw me cover 84 miles including a 20.5 mile beach run and the 36.5 miles of the Speyside Way Ultra. It has been a while since I have done a standard road marathon event. I found the small pile of kit that I collected together and meagre rations of gels and energy drink vaguely unnerving. No back-pack, no drop bags, no change of clothing, no change of shoes, no food mountain, and a car boot only half full: a very odd feeling indeed: ‘two jelly babies and 500ml of water’ did indeed sum it up. Off we headed stopping at The Inn on the Tay at Grandtully for some food. It was then on to Aberfeldy and checking in at Balnearn House B&B before heading to the race registration. Registration was quick and efficient and information readily available, along with pasta and a chance to socialise with other runners for those that wanted it. Once back at the B&B I mixed my energy drink, laid out my kit then relaxed with some TV before retiring. Race nerves often get the best of me and I generally do not sleep the night before an event, but I had slept well the night before the Speyside Way race 2 weeks ago, and it was a repeat performance: a good night’s sleep waking a few minutes before the alarm. I felt calm and relaxed as I pottered about getting myself organised and then went for breakfast. A fellow marathon runner, Claire joined me and we chatted away over breakfast about our running, our past experiences and our expectations of the day. The forecast for the day was not good, and at first it lived up to expectation; it had rained heavily overnight and started again as I arrived at the race control area. It eventually eased as we began the half mile walk to the start at Weem Church. There was a slight delay to the start and a light shower, but after that it remained dry for the whole race: what luck. As ever I started at the back of the pack easing into the run. Whilst walking to the start I realised that I had no plan; I had not thought how I was going to run this. I had been running ultras which are a completely different ball game. When I run an ultra I walk or interval the up hills, run the down hills, and do 12 minutes running 3 minutes walking on the flats. What was I going to do here? Do I try and run the whole distance? Do I do intervals, and if so what split between running and walking? I decided just to go with the flow, start slow and steady and just see how things would unfold. I soon fell into step with another Claire who was running her first marathon. We chatted and ran together for a few miles. I felt good; comfortable, relaxed and steady, enjoying the company and scenery. This is a particularly lovely part of Perthshire. The route undulated along. I walked briefly round about 4 miles to take a gel. I was sticking with the regime where I try to take on 60g of energy every hour. We passed a field with a pony that was galloping along, getting into the spirit of the event in its own way. Soon I passed a small folly at the side of the road and knew that we were close to Kenmore. It felt so much better than last year. Next I was running over the bridge at the source of the Tay, through the gate arch into the Taymouth estate, round past the castle and then the hill. In the grounds I had drawn level with a couple of runners and we chatted, Emma and I decided we would stick with our ultra technique and walked up the hill, picking up the pace again as we went under the stone arch out onto the road. As we had passed the front of the castle the first half marathon runners started to pass us. I had a near miss as I took water at the station as we came onto the road; a half marathon runner coming up behind me clipped my heel and we tripped, narrowly avoiding falling. I knew that next section was downhill back into Aberfeldy and so kept the pace up optimising the downhill. The miles clicked over and in what seemed like no time I was in Aberfeldy. I took a brief stop to re-stock my gels and drink bottle and down a can of my favourite caffeine hit: Starbucks Double Espresso shot. I set out on the 2nd lap still feeling good. This was turning into one of those perfect runs where everything just seems to come together. Fourteen miles, at 15 miles I decided I would start to do a rough intervals walking a minute after every 15 minutes running, I passed a couple of other runners, 16, 17, 18, 19, past another couple of runners. Over these last couple of miles I felt a sense of euphoria, a lightness, happiness, and well being; a feeling to be savoured and one that you don’t often get. I know it is a reaction to the chemicals in your body as it tires, but it feels good. At 20 miles as we came back into Kenmore I started to feel tired. Was I going to hit the wall? Theoretically, if I had got my nutrition right that should not happen. I focused on my music and my surroundings and pressed on abandoning my intervals. At 21.5 miles I popped a 2nd surge gel with more caffeine, which worked its magic and as I walked up the hill for the 2nd time I felt my strength and energy returning. happening in my body. The feeling passed, as did 23, 24 and 25 miles. Then it was back into Aberfeldy and 26 miles just before the turn onto the Wade Bridge and the last couple of hundred yards to the finish. Over the bridge and the final turn into the field and a sprint to the finish and I was done. What a run! I got my medal, did a brief interview before getting my race time and certificate and finally laying down with my feet up against the back of a chair for a rest. This was followed by a gentle walk back to the school and community centre for a well earned massage, and some food. It was not a fast marathon, but it was the fastest I had done the distance in since 2009. It was faster than I had expected given that I was still recovering from an ultra. I paced it well and I got my fluids and nutrition just about right, although I probably should have taken more water than I did. I had literally enjoyed every mile. There were bonuses too: no chafing, no falling over and no gastric distress. A job well done in my penultimate event before the Antarctic Odyssey in only 10 weeks time.